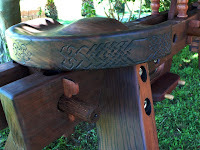 I've been talking about making a shaving horse for a while now. So what's the hold up? 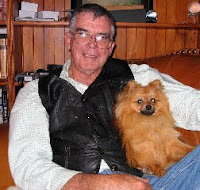 It's because I keep finding images of benches with features that I'd like to incorporate into mine and because of woodworkers like Ian McLeod from Australia (pictured with his shop dog, Woody), who sent me photos of his functional and beautiful shaving horse. Ian used reclaimed iron bark wood from a 1904 foot bridge for his self-designed, multi-use bench that functions as a shaving horse, saw horse, planing bench, general work table, and metal bending jig. The bridge can be removed by knocking out wooden wedges and removing the spindle on which it pivots. At that point, the four short spindles that sit beneath the bridge can be used for bending light metal rod. 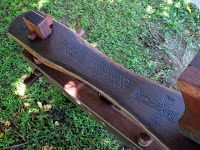 When the bridge, the head/footrest assembly, and the seat are removed (all attached with wooden wedges), the top surface of the side rails can be used as a workbench. The rectangular post that hangs beneath the shaving horse is used as a bench stop. Ian hand carved the decorative designs. The color and texture of the wood is natural and is finished with Danish oil once a year. 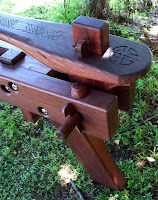 Ian's shaving horse is an impressive example of where form and function are equally important. The group photo page below shows shaving horses and bowl benches I found on the internet. I don't remember where they were originally posted, so if you see one that belongs to you please let me know so I can give you credit. Or let me know if you prefer that I remove your image(s) from this post. 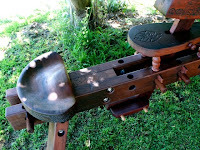 Here is a link to a clever cutting bench for bowl making. At some point I'll need to commit to a design so I can finally get my horse out of the starting gate.